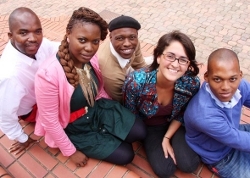 On the eve of Human Rights Day, youth leaders from Activate! Leadership joined forces with stakeholders from the public and private as well as non-governmental sectors to launch Activate! Exchange, a dynamic think tank forum that will be rolled out across the country to engage and harness the problem-solving capacity of young leaders in all communities with focused civic action. “The current challenges confronting South African youth also offer us endless opportunities to get involved in our communities. However, we need a better understanding of these social challenges so that solutions can emerge from the bottom up through engagement and consultation,” said Activate! Leadership Activator Nqaba Mpofu speaking at the launch at The University of Kwa-Zulu Natal’s Graduate School of Business and Leadership Learning campus at Westville. Activate! Exchange follows the launch in 2012, of Activate! Leadership, a network of young leaders in South Africa funded by the DG Murray Trust, that is currently supporting 800 young social entrepreneurs and their projects across the country. The organisation aims to support 5000 social entrepreneurs by 2017, said Activate!Leadership chief executive officer, Chris Meintjies. “Activate! Exchange came about through the necessity to communicate the exceptional work that these activators are doing to change and challenge their communities fundamentally to improve socio-economic conditions. All the projects that are underway are innovative and relevant and will have massive large-scale benefits on the broad society,” said Meintjies. According to Malusi Mazibuko, one of Activate!Leadership’s facilitators and the director of the KZN Youth Empowerment Project, Activate! Exchange was about the innate responsibility that individuals, especially the youth, have to find innovative, non-partisan ways of outlining initiatives that speak directly to the immediate needs of the different communities within South Africa. Activate! Exchange will be rolled out nationally during the course of 2013 with the next event scheduled for Johannesburg in June this year. For more information about Activate! Exchange go to www.activateleadership.co.za.